If you are at all interested in finance, and especially if you are interested in working in finance or are currently in a finance role and looking at what else you can do then you would have heard of hedge funds. They have been in the news a lot recently however they are not really a new concept. We hear of billions of dollars being made for the owners of these funds and the spectacular returns they offer their clients. Less often we hear about their spectacular falls from grace as well. However when you really think about it - it is actually hard to nail down what a hedge fund is in a simple sentence. This is because it is not a homogeneous beast. They use many different strategies to invest money all with the intention of providing a return to their investors. This post will cover the basics of what makes a fund a hedge fund. I will do a post soon on the different strategies that hedge funds use to make money. Traditionally hedge funds referred to funds that attempted to generate returns that were uncorrelated with market returns - that is they were 'absolute return' funds. However more recently the name has become associated more with the structure of the fund and the class of investors that it caters to rather than the investment strategy. Hedge funds, like all other investment vehicles are regulated by the market in which they operate. In the United States, and in most jurisdictions they cater almost exclusively to rich investors and so are less regulated than those funds which cater to retail investors and so have much more stringent prospectus and risk requirements. What are Self Managed Superannuation Funds and are they a good idea? This is a sponsored post. It was done in partnership with Clime, an Australian based fund manager. All the content included in this article is my own and I have not had to have it 'approved' or vetted in any way. I am happy to do sponsored posts where there is no interference in the content of my post. In essence a self managed super fund is a small superannuation trust which is set up for the benefit of an extremely limited group (1 - 4) of members. It is a mini version of the large superannuation funds out there but instead of being pooled with thousands of other investors, this superannuation trust is only for the benefit of a select group. Why would you set up a SMSF? What are the downsides to setting up a SMSF? Should I write sponsored posts? On this lovely Friday I thought I would throw out a question for all the readers of my blog; Should I do sponsored posts? Many readers know that I started this blog originally just to track my net worth to my goal of 90 million. Hence the name of my blog: Journey to 90 million. However since then it has spawned into something I didn't quite expect and I have really become dedicated to updating this blog on daily basis. It was never my intention to make money from this blog. As at writing this post I have well over 300 posts and the advertisements I have on the sidebar and top of the bar barely generate any revenue. Put it this way...Google sends you a check every time you reach A$150 of advertising revenue and I have yet to receive my first check in over 2 years of posting. That's not a great income generator in anyone's book. That being said, I am not averse to generating income from the blog as long as I get to maintain the reputation of the blog. This is why when I do book reviews I'll generally put a link to different book sites you can buy them from and theoretically I get affiliate revenue any time someone clicks on the link and buys the book. So far I have not really made money off this either. I was quite content to go on posting on this blog because I genuinely enjoy doing it when an opportunity arose recently that I was reasonably tempted by. I was offered a sponsored posts on a topic I was actually already drafting. The way it works is this: I write a post I was going to write anyway and someone pays me sum to put a link to their business in the post along with a keyword. Investment review: Did my exchange rate idea work out? Approximately 18 months ago I did a post on the exchange rate opportunity that could be exploited using foreign index funds because the Australian currency was so strong coupled with extremely weak share markets overseas. I also ran through a very specific example of an investment I had made in the FTSE100 which was to take advantage of the weak pound as well as the weak English share market. This post will be a review of that idea 18 months down the track, along with an assessment of how I thought about the investment along the way. As it turns out, this was a rather good investment to make and I have been very pleased with the results. The chart below shows the performance of the investment over time. 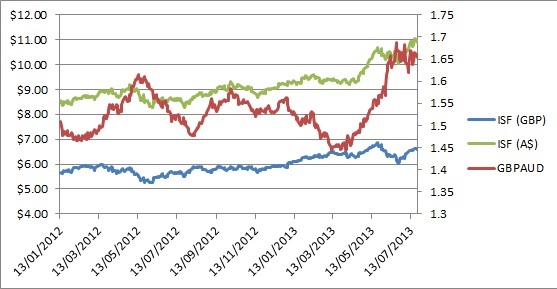 The blue line is the performance of the index fund (ISF) in pounds. In the circa 18 months that I owned it the index returned 16.3% plus another ~2% in dividends over that time so approximately 18.3% return over 18 months. 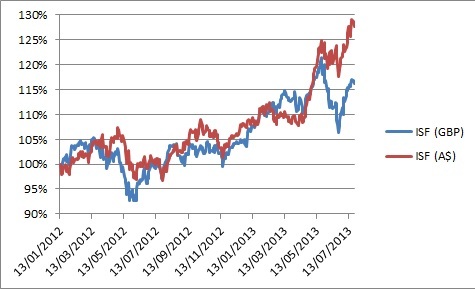 This is annualised return of ~11.8% which I am very happy with in itself. However the kicker (and the original point of the investment) was the return benefit that the exchange rate would give when it returned to 'normal' levels. It has not yet returned to normal levels but it is certainly going in the right direction. The A$ depreciated by 9.7% against the GBP in the 18 months. This resulted in a total A$ return on the ISF investment of 27.6% before dividends or ~29.6% after dividends over the 18 months. This is an annualised return of ~18.8%. I had no idea that the performance of the UK share market would be strong over that period, the real underlying reason was that the currency gave me protection on the downside and provided significant upside in the event that it returned to normal levels. ...however during the investment period it did not always look so happy! The chart below shows the return on investment over time. The red line represents the A$ performance of the investment and the blue line represents the GBP performance of the investment. For the first few months of the investment, it did not seem to be a great investment. Indeed the share price was not really going anywhere and the currency movements made me think I had missed the boat at times. However I had in mind what I thought a fair price for the currency was so I continued to wait and of late, even though the share price has come off significantly in GBP, the fall in the A$ has been so sharp that this has not had a real impact on the A$ return. So did I sell out of this investment? Not yet. I still do not think the Australian dollar is at fair value even though it has fallen significantly. I think there is a little way to go. Although I think the same trade is still available, the level of upside is not what it was 18 months ago so I probably will not be throwing more money into this investment strategy. Was it just a fluke? Did I just happen to pick the right currency and the right share market? Was it just a fluke? I don't think so. I actually did the same trade with a much larger amount of money into the US market and the returns from that have been even more impressive than the returns I outlined above. The reason I went through this example in the post is because it is the one I posted about 18 months ago. Note that this is one of the investments I made that came off. Next week I'll post about one that continues to cause me significant pain that I posted about several times in the past. I have no problem admitting my losses and it is worth all those who are new to investing to know that you can still get good portfolio returns even when you have a couple of dogs in your portfolio. As always this is not investment advice. Just a demonstration of what I have done and make sure you think through your own investments and use qualified advisers if you require it. I don't often watch television however happened to have very little to do a few days ago and so noticed something I wouldn't have ordinarily noticed. The negative political advertisements about the economy have ALREADY started. They have started before a general election has been called and, like most political advertising, is so biased an inaccurate as to be rather misleading. For all my international readers, this post will be a complaint about the Australian electoral cycle however you may get some benefit when thinking about advertising in your home districts when you go through election cycles. What sort of advertisements am I talking about? I tried to find videos on YouTube which illustrated my point but appears that Australians do not bother enough to put their political advertising on YouTube and thankfully our politicians are not yet internet savvy enough to deploy the full gambit of internet advertising. Alas, that means that I will need to describe for you the type of advertising I am talking about. The particular advertisement that got to me was one in which the Liberal party pointed out that the Australian government was running up a deficit of $100m a day in 2009/2010 when Kevin Rudd was last leader of the Australian Labor party. The implication of course being that with him now back in control, if you vote for him he is going to destroy the economy and pile on the national debt again. It reminded me of an advertisement a few election cycles ago where the basic argument was that you could not trust the opposition party because every time they were in power interest rates rose, thus if you put them in power again, the interest rate that you pay on your home loan will go up again. This happens at EVERY election cycle. And both sides of politics play this game with different issues. I am particularly concerned about economic policy and the Liberal party is typically the one that runs the advertisements about how the Labor party is going to ruin the economy and look at their past record. The Labor party does it about other issues such as how the Liberal party cronies up the businesses and sticks it to the ordinary Australian worker. Why do I hate these sort of advertisements? Why are sector funds so much more expensive than broad based funds? If you invest in exchange traded index funds (ETFs) at all, you will have noticed that broad based index ETFs (which cover whole markets such as the Australian sharemarket or the US sharemarket) tend to have much lower expense ratios than those exchange traded index funds which cover specific sectors such as utilities, resources or financials. Why do sector specific ETFs cost so much more than index ETFs? Can I say upfront, that although I tried to research this I was not able to find any particularly good sources of information out there about why this is the case. These conclusions are therefore my own. I am happy to be corrected on any of them or for additional reasons to be added. If you have any suggestions please add them to the comments bar or send me an email and I'll be happy to include them. As we all know, budgeting and saving are inherently linked. But as anyone who has tried to stick to a budget knows...things always come out of the blue and although you promised yourself that you should save a certain amount this month it is always less than you imagined. The key to this is making sure that the cash you are saving is OUT OF SIGHT because if it is, the chances are you wont think about it when you are thinking of spending money. As outlined in my last post on this topic - 'The free market is NOT perfect: Knowing Economics 101 is not enough' - I will be doing a series of posts rebutting the claims of free market advocates masquerading as 'libertarians' that we would all be better off if the government was not involved in the free market. Indeed the only way to create a more efficient society where everyone is better off is if the government stopped getting involved. These points of view have been gaining momentum in recent times, especially in the United States, although I have noticed more and more people starting to join libertarian type organisations here in Australia as well. Indeed, in the lead up to an election, these voices tend to get significantly louder. I will be rebutting many of their claims in the coming weeks - however I am by no means left-leaning in my preferred economic outlook. I believe that market mechanisms are broadly the most efficient because they most closely play to the human condition. However I believe that the market is NOT perfect and that regulation and intervention is needed to maximise efficiencies. Free market advocates and the libertarian strain of these in particular rail against rules, regulations and government intervention in the operations of the markets claiming that all this does is create inefficiencies. Fine libertarians...if you don't like rules and regulations then the first thing I want you to give up is property rights and see what that does to market efficiency. Positive Dilemma: Is it an issue if your property becomes positively geared? In Australia, one of the biggest benefits of investing in property, or borrowing significantly to invest in any investment class (including shares) is the presence of negative gearing. That is, you can claim a portion of your losses (your effective tax rate) back against your other earned income. How to investment properties become positively geared? Why does this cause a dilemma? There are several investment books (which I don't like) which bemoan the fact that people are so focused on negative gearing and promote the idea that positively geared properties are ideal because 'they put money in your pocket each month instead of taking it out. This is only right at a very simplistic level. What the opportunity cost of having your funds invested in this property versus in another product? Emissions Trading Schemes...why would a conservative party oppose it? If you live in Australia you will know that the Prime Minister, Kevin Rudd, announced that he wanted to move from a carbon tax to an emissions trading scheme (ETS) next year. What was baffling to me, was the response of the opposition leader, Tony Abbott who is looking (according to the polls) like almost certainly being Australia's next Prime Minister. I suggest reading this article for a brief overview on the comments made by both parties and I will do a brief overview of why I think Mr Abbott is just playing politics and assuming the Australian voter is exceedingly dumb. Negative externalities are those outcomes of the 'free market' which are bad, however which are generally not taken into account in the price of the good or service being produced. In the case of energy for example, coal is the cheapest form of fuel in a private sense (i.e. to dig out of the ground and to burn) however there is a social and environmental cost to this which does not get included in the price of coal. However there is a very real cost to this which is borne by society in terms of environmental effects which need to be fixed / cleaned up by future governments and taxpayers. This is what is known as an externality. Note that externalities can be both positive and negative however they both face the same problem in a market economy - the benefits of positive externalities and the costs of negative ones are not included in the price of that product. The solution to externalities is to try and internalise the cost or benefit in order to reflect the true cost of the product. This often has to be done via regulation (especially in the case of negative externalities) as profit seeking enterprises are never going to voluntarily give up the lower private cost / higher social cost item. I have posted before about how I moved out of home earlier in the year and doing all those things I had been avoiding doing for years like shopping and my own laundry. Before you tell me that you moved out when you were 18 and have been doing it for years...that's the exact reason I didn't move out sooner (and I also enjoyed the limited rent I paid my parents compared to what I pay now). I have been slowly learning the tricks of saving money while shopping. There are certain days of the week that supermarkets are cheaper than others. Hint: Monday nights for some reason are terrible for sales and discounts while Wednesdays always seem to have good bargains. I also recently learned to avoid express convenience stores like the plague. One thing I learned early on was the benefit of unit pricing. In Australia shopping centres need to put unit pricing on the price labels so that you as a customer can easily compare which products are cheaper and which are more expensive. Prior to this law being introduced companies would intentionally make their products odd weights, sizes and shapes so that customers could not compare prices as easily. If you are sensible about your shopping and know what you want to buy and you are reasonably frugal so don't want to spend more than you have to...you will automatically we drawn to bulk type items which sell for significant discounts compared to their handy smaller counterparts. I have been thinking about this topic for a while actually and have spent the last week writing down my thoughts on it on various scraps of paper because I thought that I could make it into a series of posts which outline why I am not, nor have I ever been, a believer in the free market. This may seem strange coming from an ex-investment banker, turned investment professional and also as a person who writes a blog tracking their wealth journey and sharing what my goals and aspirations are. However I should state up front that government control is a sliding scale - an economy is NOT either free market capitalist or planned socialist. There is no pure free market capitalist economy in the world just as there are very very few remaining planned socialist countries in the world. Why did I start thinking about this? I was motivated to think about this issue when I was watching some clips about the Tea Party movement in the US. The whole movement struck me as fundamentally odd...the people protesting and joining these movements looked like those who most benefited from government programmes and assistance. I also wondered about the economic policies and catch phrases that right wing politicians and free market advocates often throw out there which are so simplistic that they are effectively wrong. And then it struck me...most of the general public has some appreciate of basic economics - they can see, think about and visualise simple economic concepts in a very real way around them. However I do not believe that most of this same public has an innate understanding of the assumptions that underlie these 'simple' principals nor the consequences of what they are asking for when they demand a free market economy. As I was thinking about how I would approach this series of posts though, one of my economist friends sent me a link to this article which explains how and why Econ 101 is killing America. It is one of the best and most succinct articles I have ever seen. It busts many of the myths that the general public has in their mind. I highly recommend reading it. 90Million Blog's 2 year anniversary! Earlier in the week I realised that this blog has been up and running for 2 years now which has amazed and surprised me. This blog has morphed from one which I posted in occasionally and was really a way of holding myself to account for my financial performance to one where I try and comment on those things which I am constantly learning on my wealth journey. I wanted to say a big thank you to all the readers, commentors and those who send me emails with suggestions, ideas and questions. It has been great to communicate with others on their wealth journey! The number of people visiting the site has grown exponentially and I hope that I am providing some value and perhaps a little bit of light entertainment and procrastination for my readers. The financial markets and the investment world generally has gone mad. When bad news is good news in the stock market and I see headlines in the financial news saying that the stock market rallied on weaker than expected financial news or that it was weaker on better than expected news you know that the markets are not working in their proper way and that something out of the ordinary is happening. Even if you do not follow the financial markets closely you cannot have failed to notice the stock market tanking over the last month. Indeed most major stock markets have lost the strong gains they have made since the start of the year. One of the major causes of this was an announcement by Ben Bernanke of the US Federal Reserve that the economy was recovering to such an extent that they would consider starting to roll back QE3. When QE3 was first announced I posted about it, what it was and why the share market reacted so strongly to it. This was to force down interest rates and force lending to start as the yields on these products were depressed to levels so that people would have to invest elsewhere. QE3 was only ever going to be a short term measure! So why did the market react so negatively towards the announcement that it would be scaled back? 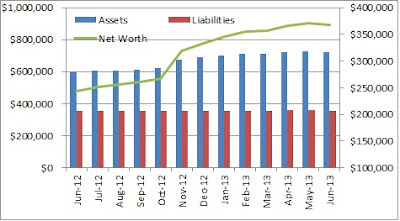 As I mentioned in my June 2013 net worth post my personal expenditure was off the charts this month due to having to repay very high credit card bill and this impacted my ability to save and invest this month. I am really struggling to keep my personal expenditure under control which I have discussed further below. Yesterday marked 2 years of me writing this blog and of tracking my net worth to my target of $90 million. It has been an up and down year for me both in terms of my career, my personal life and the focus of this blog, my wealth journey. In absolute terms this was actually a very similar performance to the 2012 financial year. In that year my net worth increased $120,000 whilst this year it increased $124,000. Compounding would normally have more of an effect however in the 2012 financial year I was still getting paid an investment banking salary and bonus which I did not get in the last year. 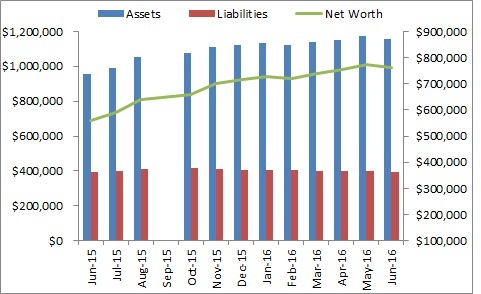 This completes the second year of my net worth tracking series and I will post a year on year analysis as a summary of how I have been going since I started tracking my net worth shortly. However as per usual this post will focus on how I performed for the month. I am disappointed to say that, as you can see above, this is the first month in which I have recorded a negative net worth performance since I started tracking my performance 24 months ago. This was primarily driven by an abysmal month on the share market combined with an inability to save a great deal as I had a rather big credit card bill to pay. I have had bad months before on the share market and these have not caused me to have a negative overall performance for one major reason - previously my share portfolio was of a size that even if there was a terrible month, regular savings from my wage could outweigh this. Unsurprisingly as my wealth has grown, the movements in the share market can outweigh any amounts that I can actually save from my monthly wage. I knew this was going to happen at some point, so am not overly disappointed to see it.